Alright, I am starting to run out of niche business ideas that I should be considering for this round, so this might be the last one. However, if you have a great niche idea that you would like me to consider pursuing and blogging about on the website, then submit your business idea right here. First of all, thanks everyone for the great response to my last post about my journey from corporate life to full time internet marketer! Okay, today I wanted to discuss the potential for building niche eCommerce websites (with traffic primarily from search engine optimization). The only reason I am hesitant about this idea, is because when I first started NichePursuits.com, I viewed it as a way to try other business ideas that would move me away from relying on the search engines as heavily. As you all know, my current business of building niche websites is 100% reliant on search engine traffic. So, one of the main reasons for starting this blog was to diversify away from that. However, a couple of you mentioned that you would be interested in seeing me do an eCommerce site or some sort of drop shipping model. I actually think this area of business has great potential. In fact, I actually believe that Google likes eCommerce websites more than just informational niche websites. So, I think this type of site probably has a slight advantage in the search engines. I don't have any hard evidence to prove that, but my guess is that Google has this worked into their ranking algorithm somewhere – which makes complete sense to me. If someone is searching for something to buy – an eCommerce site that actually sells the product probably should get some preference over purely informational sites. Anyway, I just threw out a few unique keywords that are product related. I haven't searched but there already could be a niche ecommerce store on each of these already. The point is that if I were to tackle this business pursuit, I would plan on finding a low competition keyword that I know I could rank well in Google for and then build a niche eCommerce store around that product. I would NOT go the other way around of deciding on a product and then hoping I could get traffic to the site. This is a good way to build a failing website right off the bat. Can I Get a Piece of the Pie? Also, to clarify – I don't plan on keeping any inventory myself of course. I want all this to be done on a drop-shipping type model or in some other fashion where the customer orders from me and the product is shipped from the manufacturer. I don't have the time or desire to mess with inventory. Anyway, that's about all I have for today! What do you think? Should I try and find a great niche eCommerce segment that I could build a website on and document the process on this blog? Remember, I will only be doing ONE of these ideas that I have discussed over the past few weeks on this blog. At least for the next 90 days or so – then I will choose a new idea. Perhaps more importantly to consider, is this something that YOU should be doing? After all, one of the purposes here is to get YOU excited about different business ideas and to get the wheels turning in your head to think about things that you could be doing to be successful. I’m new to your site, but was inspired by your JOB quitting story. I’m close to leaving the 9 to 5 myself. Barry – I deleted the link you left (too promotional) – however, I would be interested in hearing your thought about the ecommerce model here. Sounds like you have found some good success with it – congrats! I’ve been wanting to do a drop shipping business too. The problem is finding quality products at good prices. It seems like there are a lot of middle men in the drop shipping world as well as plenty of scammers. There are several drop ship businesses for sell on bizbuysell that are netting around $200k/year. Gabe – Yep, there would be a good deal of research that would need to be done to find some great products. And yes, there are lots of middle men – which is why I would be call manufacturers directly if possible – rather than using a “dropshipping website” to find sourcers. I’ve thought about this as well, as I am currently a powerseller on eBay and sell on Amazon as well… I liked the idea of an eCommerce site to avoid all the fees I pay on eBay/Amazon. However, it seems to me that eCommerce sites create another job… to where I wouldn’t really be able to walk away from it very easily. It would need my constant attention and that’s what is not appealing at this point in time for me. Lance – I disagree that it creates another “job”. 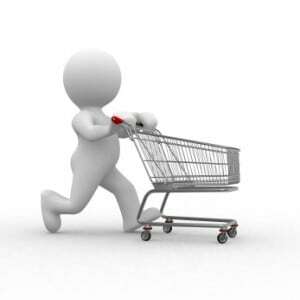 In fact, the whole point of drop shipping is to eliminate the inventory and requirement to spend time shipping – etc. Yes, there is some upkeep – but much less than a job. And the payoff can be HUGE here. I am envisioning a site that gets it traffic from search engines so there is no marketing of them. Hello Spencer, I am very interested in the ecommerce business and have only some experience online, do you have a step by step blueprint on what exactly to do, and how getting it to the first page of Google? Ooops hit reply by accident. I know that this model will require my attention to process orders. I’m wanting to take what I do offline and sell online. Right now I have a targeted keyword for one of the products I sell. It is one style with 20 color options and customization. The keyword gets 1600/ mo exact match searches and my profit per order is $39. It’s a drop shipping item. I’m currently using word press. Can anyone recommend an easy to use word press plug in and/or how to set this up. Cool – sounds like a good product…best of luck! A website that gets free traffic and sells products while you sleep and someone else ships the product – which you never touch. What about this is not passive? What am I not seeing here? Yes, there will work and upkeep involved – but this is not even close to owning a retail store here. how when you do no work…. that was to victor not you spencer! sorry hit the wrong reply! Hey Spencer- great topic. I actually own a couple niche Ecommerce sites and they have been succesful. A good month at peak season will bring in $2,000. This is for a special kind of bike. Others are more steady but less money. They are work though. That’s why I’m trying to get into adsense sites. With Ecommerce not only do you have to get ranked, then you have to constantly update the site, process orders, etc…, like Lance said. Don’t get me wrong, it beats a regular job though. And as far as Lance was talking about fees, there are plenty of them with Ecommerce. I take most of my orders through paypal and they get a nice chunk. I’ve been thinking about getting a credit card processor if I can get my orders up because they have hefty fees as well. In summary, it’s a good niche, more hands on, but beats working for someone else. Billy – great comments. I don’t mean to sound like I think eCommerce is all passive – its certainly work. But on a scale from owning your own retail location it doesnt even compare. I guess as IMers we want everything to be set it and forget it. Im just saying I don’t mind getting my hands dirty a bit. I can imagine that processing orders and dealing with customer support could be a big time commitment. However, I feel like a lot of this could be done by someone part time if its eating up too much time. If I do pursue this idea, I will be asking lots of more in depth questions and I will be very interested to hear what you say about it since you have some experience here…thanks! One more quick note. To get it to a more set it and forget it, type thing, I think it’s possible to get 5-10 and outsource it. Obviously you’ll make less but once the initial set up and rankings are done, it’s more passive. This is something else I’ve been thinking of. An eCommerce site imho can be both a hinderance and opportunity. The thing that seems to be the linchpin in all of these Niche ideas more than anything else is processes. I know myself we do online marketing for brick and mortar business, and the process behind the business is becoming more important each day. So look at how it is developing first then create processes to make it passive if that is the idea. Pete – great point. I think developing a business “process” is actually the linchpin of every business. This is includes my niche websites and everything else. Excellent thoughts. I think this is the best idea in your list, go for it! 2nd comes the lead generation idea which also seems interesting. If this is what you pursue I could definitely help out. I have a great store manager which makes uploading product pretty easy. I’d be more than glad to answer any questions. Customer support is by far the most time consuming though. help already. Keep it up! The problem with online retailing is that there are news about sales taxes being charged in more and more states. This is the reason Amazon cuts their affiliates. But when it comes to AdWords, i think Google likes to have serious legitimate businesses advertising on their system. What is good though is that you are not affiliated with anyone here. If you have heard news, they say that more browsers will have feature that lets people disable tracking by online businesses. I hope this is not the end of affiliate marketing. Unless you outsource, you will be chained to your ecommerce stores whole day or will have to have constant access to the internet and give support by live chat or phone. I am talking about a small “niche” ecommerce site here; so I certainly wouldn’t expect to be doing live chats and phone calls all day. However, if I had enough customers that this would be the case – then that’s GREAT! Spencer, this is the strongest idea that you have. In fact, I have been meaning to get into this type of business myself. Please pick this one so I can follow along and launch a similar type website at the same time! Jon – we’ll see what happens. I won’t be picking – YOU WILL! I will be setting up a poll perhaps next week with all of the potential ideas listed. The one with the highest votes from readers gets my full attention. Love that one and lead generation…But I just think there’s another way to make big money…CPA offers, no one mention it here,I love the whole thing,even if I never made 1 cent with CPA offers,I hope you come up with CPA strategy in the future.There’s alot of money to be made. Spencer, I like the spirit here. But, I ultimately think it is too similar to your major area of success (as you noted your own inklings in your writeup). Sure you are changing the monetization, but ultimately if the traffic comes from the same strategy as your other sites, are you really diversifying? If you ask yourself straight-up, I think you would say no. After all, the place where you ran into issues in the past was in the traffic side of your roster of sites, not the Adsense side. Good initiative on this, but I think you already have better options to pursue. p.s. I know this is the wrong area, but if I were to recommend a pursuit: video blog targeting a niche passion, monetizing via ad revenue. This is something I would be highly curious about as I am interested in doing this myself. James – apparently you know me too well! Yes, I am actually very hesitant to put this idea into implementation for the very reasons that you mentioned and which i mentioned in my post. I only wrote about it because it was a suggested business idea – and wanted to fully explore its potential. This is very interesting. I’m not clear on why the majority here seem to think running an ecommerce site is like a “job” or that you wouldn’t be diversifying enough when it comes to traffic??? Maybe the commenters here just aren’t familiar with how these niche ecommerce sites are actually run? 2. You get a supplier who’s willing to dropship for you (which means they handle ALL the fulfillment and when you get an order you simply email your supplier. They carry the inventory, they package it, they ship it. Can’t get much more passive than that). Essentially your “job” consists of emailing an order to your supplier everyday. I can do that from my phone while I’m sitting at a restaurant. Same with answering a question or two by email. 3. You load up the products in an ecommerce store. There are many of these solutions available at around $25/month. The site itself is basically complete, you just plugin a logo, copy, products and descriptions. This is more or less a one time thing considering it’s a niche site with niche products. 4. Then you market your store using ANY and everything method available online. Why just stick with organic traffic from Google? Get your site ranked WHILE you go after other traffic sources. PPC, Social, Video, Google base, etc. These are the things you’d be doing to market just about anything online. For example a close friend of mine recently sold his dropship website for $240,000 and while he ranks great in Google now, he started by creating “review” videos for his many products and blasting them out all over the internet- Tubemogul.com is very helpful for this- and free. 100’s of brief but helpful videos all over the internet bringing targeted traffic to his store. The point is there’s no reason to depend entirely on organic traffic. Also realize how easy it is to rank organically for all those product names or model numbers and those are some of the best converting keywords. This is entirely different than hoping google keeps your adsense site at the top of the serps, because when your ecommerce site is ranking well for a product- google likes that! Because that’s what their searchers are actually looking for! So there’s my rant. This is not tough work in the slightest. Especially when compared to running leads, or doing cpa offers, or bidding on storage auctions, and all that. Quite the contrary, there is so much upside to this it’s incredible and it absolutely is diversifying from adsense sites in my opinion. It’s a completely different business, monetized differently, it’s viewed as an asset by the search engines, and I haven’t even touched on the backend. What could you do with a list of niche buyers from your ecommerce site? You market to them month after month. That list is another asset you don’t have with adsense sites. Nash – Excellent analysis here – thanks for sharing! I agree 100% with you points and they are well stated. Its great to hear that I’m not the only one that thinks an ecommerce site actually can have some passive income potential! I’m certainly not opposed to putting in the hard work, but the reality is just as you stated. If you develop a great system, and use the right tools, then setting up and monetizing a niche ecommerce website can actually go very well. To be honest, I was starting to think that I should not even consider this one, but your great input has got me second guessing that decision. Maybe I should keep it in the running after all. Especially if I focus on utilizing traffic methods outside of the search engines, this idea becomes much more attractive. Thanks! Hi there spencer. I am a IM and programmer from Pakistan and looking to create an Ecommerce website that sells products online. As online purchasing has recently taken a boom here in Pakistan. Many local stores have created there websites to sell there stuff. I need advice and a proper plan to follow and create an ecommerce website. Concept came from watching an add on cable tv. Which was on an indian channel of the website flipkart.com. They are successfully running in INDIA and there is a big opportunity to create an online store just like that in Pakistan as there are no popular ones at the moment. I have a team of programmers that created many ecommerce websites. No issue in that thing. I have got the best team in my hand. My main question is from where will the inventory to sell come? Do i have to buy it and store it. or is there another way? I have read a WSO on WF about running a successful ecommerce website but aint find anything related to that. From where will the inventory to sell come? And your opinion on my idea. I enjoy your blog so much. Thank you for your valueable articles , I have learnt a lot from them. Currently, my wife is looking for an online business, and I think ecommerce is the best option for her because she is a stay at home mom with two kids. I am eagerly waiting for you to come up with a plan so that my wife can follow and be successful with it. I would not set up another e-commerce store if you threatened me with a knife. Bigcommerce offers the best deal at 25 per month. However, having a store is a nightmare! You get orders from other countries, most people end up buying on item, which you lose money on. The conversion rate is really low because they don’t know you from Adam. Amazon links or big companies via Commission junction is the way to go. You have to pay paypal a monthly fee to take credit cards. If you do not pay a monthly fee, people get confused and think they have to have a paypal account to buy something. That is how paypal has it set up. If you want to use another credit card processor, good luck with that. Most of them are con artists. I’m now doing adsense, Amazon and commission junction. I cannot tell you what a relief it is to just sign in to my accounts and see how much money I made! No orders to follow up on, no liability for the product. Simple. Great feedback Deborah from someone who has actually run an eccommerce site! I agree that Adsense, Amazon, or other affiliate type site does sound much easier! Hi spencer, i am a honest reader from china, i love your articles which are informative and logistic. I want to put my question here to see if i can get some infos to help me build the ecommerce site well. So the question is: when we seo a normal site we know it involved quality content building, keywords density and so on, but you know what the biggest problem is about the content unique, a normal product which could not has or don’t need so much content, instead of something brevity like specifications or properties. so maybe my product pages have 30% or lower unique. Bing and other search engines. few genuine thoughts on this issue. Seriously.
. many thanks for starting this up. This web site is something that’s needed on the web, someone with a little originality! What’s up, after reading this amazing article i am too happy to share my knowledge here with colleagues. A lot of times it’s very difficult to get that “perfect balance” between superb usability and visual appeal. I must say that you’ve done a amazing job with this. Like a many others, I was directed from Pat Flynn’s passive income blog. This article was the persuading factor that stopped me from diving head first into a two foot deep pool of ecommerce dominated sites and breaking my neck trying to rank #1. I’ve recently found another completely abandoned, highly profitable niche to easily outrank the competition. Thanks, Spence!